With over 1,600 dealers in 23 states, Pace is the leader in outdoor power equipment distribution and marketing. Why Choose PACE? We’ll Tell You! PACE was founded in 1982 for the purpose of distributing Honda engines to retail stores and OEMs in Michigan and the Toledo, Ohio area. Our original ownership team had worked in a retail equipment dealership business that was founded in 1928. The retail dealership experience gave PACE a unique perspective on supporting dealers and customers. 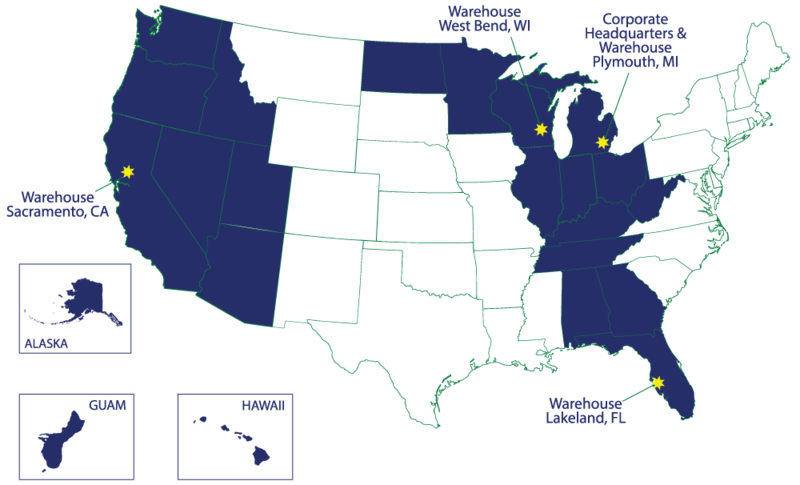 Now PACE boasts distribution territory covering the Midwest, South East and West Coast, including Alaska, Hawaii and Guam. PACE has warehousing in Michigan, Wisconsin, Florida and California; over 200,000 square feet dedicated to serving our customers. With 50 internal employees and 28 territory managers covering 23 states, we strive to provide efficient, high value distribution. As a family owned business, PACE knows the value of long-term relationships. Both our dealers and our suppliers have grown along with us. Some of our team members have been with us since the beginning. Look to PACE, Inc. for your premium outdoor power equipment needs. As PACE team members, we are committed to continual growth as individuals and as a team. We will not accept status quo as an option for doing business. There will always be an option for being better and more valuable to our vendors and our customers. We will serve our vendors, team members, dealers, and end users with integrity, accuracy, respect, and a focus on excellence in all interactions. We offer high quality products and creative programs that include free freight, aggressive terms and volume rebates to lower costs and increase margins for our dealers. Our goal is to make it as easy as possible for you to do business with us. To be recognized by our customers as the best premium equipment distributor to do business with. As a family owned business, PACE knows the value of long-term relationships. We Partner with the Brands You Want! With over 30 years experience, we know what your customers are looking for. So we’ve partnered with some of the biggest names in the industry. Place a parts order by 4 pm EST or 3 pm PST for west coast dealers and we will ship all in-stock items the same day! We have a great shipping team that is fast and experienced. art barcode technology to keep inventory up to date and reduce turnaround time for order fulfillment. Orders can be placed online, by phone or by fax. With over twenty territory managers covering twenty three states you are never far from a PACE representative. Our territory managers are centrally located to better serve your needs. We provide hands-on training in maintenance and repair, warranty processing and sales. Our goal is for your staff to be confident and prepared to bring the sale to your dealership. PACE Territory managers assist New Dealers to get started off on the right foot with extensive field work to define market opportunities and implement strategies for increasing market share. This includes “Road Map 2 Success”, a custom look at your business. We provide hands-on training in maintenance and repair, warranty processing and sales. Your territory manager will help you with product training, open house planning and participation, marketing, inventory control, and key end-user account recruitment. In addition to your territory manager, an inside representative, who works with your territory manager, is specifically assigned to your account. We make sure there is always someone available who will quickly help you with our daily business. With over 20 years experience, our service manager runs our technical training and support department. He has been around the block and has spent time in retail service, OEM testing and engine matching. His approach is to be concise and informative, and he works closely with all of our manufacturers to bring the best training to your service technicians. Become a PACE Dealer Today! Dealer Testimonials: We Love Our Dealers, and They Love Us. We are fully dedicated to our dealer base. When you partner with PACE you don’t need to worry. With over 1,600 dealers and counting, you can’t go wrong. Check out what our dealers are saying! I appreciate working with your company. Out of the four reps I deal with for my business, none of them compare to Al Latta (Sales Rep). What a great company all around to work with. All of the added support from the ground up drives me to promote your products over the competition. Thank you from all of our staff to yours, we look forward to growing together in the future. PACE has been by far the best Distributor I have worked with! Thank you so much for all that you do for our dealership. The PACE warranty department is for sure one of the best we work with. We have a great, trusting relationship with them, which allows us to better service our customers. Warranty claims get processed right away, and credits are issued very fast. Together we have made great strides in growing our business, and we look forward to continuing. Gary Balko [Inside Customer Service] is one of the best people employed by PACE. He always either answers the phone when we call, or returns calls promptly. If he doesn’t have an immediate answer, he will get one for me quickly. Working with people like Gary is why I like doing business with PACE. Gary, along with Nichelle and Todd [Marketing] are all the best in the business. PACE is easy to work with in many ways. Best of all, PACE has the dealer’s best interests in mind. This allows us to be profitable and able to afford the improvements and upgrades necessary to grow our business. I know that the people at PACE will listen and consider any ideas I have to offer, and we work together to make things better. I feel PACE has committed to me and my business, and I have in turn committed to PACE. Thank you to all at PACE for being my Distributor of choice!